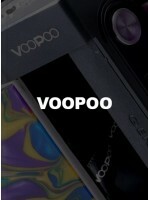 VooPoo VFL 4pk Refillable PodsReplacement 0.8mL capacity pods for the VooPoo VFL Pod Kit, available ..
VooPoo REX KitThe REX is a perfect example of what happens when ergonomic design and popular art are..
VooPoo DRAG Mini Kit w/ UFORCE T2 TankP O C K E T P O W E R B E A S T .To cr..
VooPoo DRAG 2 Kit w/ UFORCE T2 TankE X C E E D I N G . A G A I N .FIT more than you ever..
VooPoo VFL Pod KitP L A Y I T Y O U R W A Y .VFL is the second p..
VooPoo Pericles RDAF U T U R E A G E S W I L L W O N D E R .Peri..
VooPoo CALIBER Kit w/ UFORCE TankMASTERY IN ONE BARREL.CALIBER is a powerful pen-style kit from VOOP..
VooPoo VMATE Kit w/ UFORCE T1 TankY O U R S T U R D Y V A P E M ..
VooPoo TOO RESIN 180W Kit with UFORCE T1 TankN E W L O O K , N E W &nb..
Voopoo Panda Replacement Pod SINGLE PACKAvailable in 8W - 1.2 Ohm for Nic Salts12W - 0.8 Ohm for Reg..
Voopoo Panda Pod System In the size of a lighter, PANDA is portable, ergonomic with a sleak aes..
VooPoo RUNE RDAVooPoo RUNE is created for new user-friendly experience. This RDA is compatible with ..
VooPoo TOO Resin MODThe VooPoo TOO Resin Box Mod is the latest modern output vape device from VooPoo..
VooPoo UFORCE 3pk Replacement 5mL Bubble Glass1 x 3pk box of UFORCE 5mL replacement bubble glassGlas..
VooPoo MOJO 88W Kit with UFORCE TankVooPoo MOJO is a starter kit with a build-in battery and a UFORC..
VooPoo UFORCE TankTHE KING OF FLAVOR - UFORCE - AWAKEN THE FORCEUFORCE which adopts the precise OCC ..
VooPoo Drag Silver Framed 157W TC GENE Chip Box MODThe VOOPOO DRAG 157W TC Box Mod is the latest ent..
VooPoo Drag GOLD Plated 157W TC GENE Chip Box MODThe VOOPOO DRAG 157W TC Box Mod is the latest entra..
VooPoo TOO KitKIT CONTENTS:1 x TOO 180W TC1 x UFORCE TANK1 x Coil Head1 x Glass Tube6 x Gasket Ring1..
VooPoo Alpha One (α-1) 222W TC GENE Chip Box MODThe VooPoo Alpha One 222W TC Box Mod delivers the mo..
VooPoo Drag Black Framed 157W TC GENE Chip Box MODThe VOOPOO DRAG 157W TC Box Mod is the latest entr..